With a 20-3 victory over the RAF U23 XV to add to their win over the Royal Navy U23 XV on Wednesday, and their loss to Wasps last Friday, the Blues Academy completed a tough three games in nine days. The RAF are in the final stages of preparation for the Inter-Services competition which takes place this month, while Bedford made eight changes to the starting XV that played against the Navy. The game was played in strong winds and driving rain, making the task versus an older and more physical side even tougher. But the Blues took a 7-0 lead in at half-time before ending as winners by 20 points to 3. Bedford were quick to start, trying to play open rugby, while the RAF applied plenty of pressure but the Blues defence was working well. In the 38th minute scrum-half Dylan Leney forced an error at the back of the scrum, fly-half Harry Hutchins kicked through, chased and scored the game’s opening try; full-back Liam Shields converted for 7-0. The second half saw a better performance from Bedford with sensible kicking and good chases. Winger Ed Goodman finished off a blindside back-row move to take the score to 12-0. The Blues now started to control the game, with the defence working well and creating a number of turnovers. Ben Phillips extended the lead with a penalty to make the score 15-0, before the RAF replied with a penalty of their own. After a good attack, and a strong driving from the forwards, Olly Howard dived over from short range to complete the scoring for Bedford. Bedford head coach Neil Harris said: “This was a tough physical game in testing conditions, coupled with the short turnaround from Wednesday night’s win over the Navy U23. “Our defence was superb today and we matched them physically. Blues Academy director Denis Ormesher added: “Three games in nine days has been the result of a real squad effort, with every member of the squad playing a part. 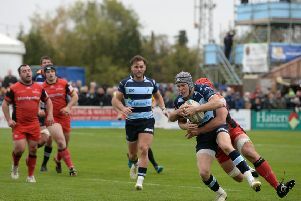 “It has been demanding physically, and there were some tired Bedford bodies at the end of the RAF game, but they should be proud of the results of the week. Bedford: Leon Patel-Champion, Aubrey Grimes, Henry Peck, Charlie Harvey, Jacob Moody, Callum Strachan, Harry Agnew, Rahat Choudhury (capt); Dylan Leney, Ben Phillips; Ross Taylor, Harry Hutchins, Stuart Livesey, Ed Goodman; Liam Shields. Replacements: Michael Bond, Ben Thompson, Oliver Pescott-Frost, Sam Copeland, Jacob North, Olly Howard, Tom Jennings, Max Titchener.